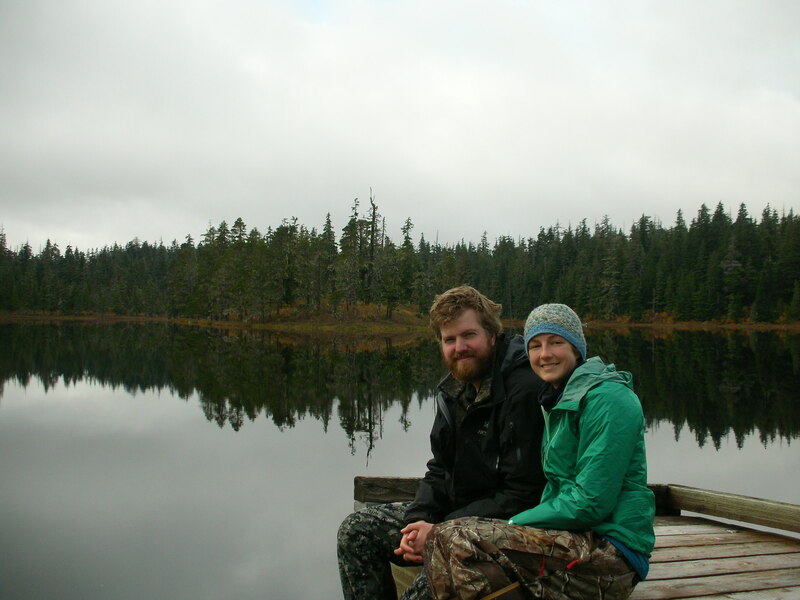 I was fortunate enough to be able to accompany Lee on a moose hunt this week. 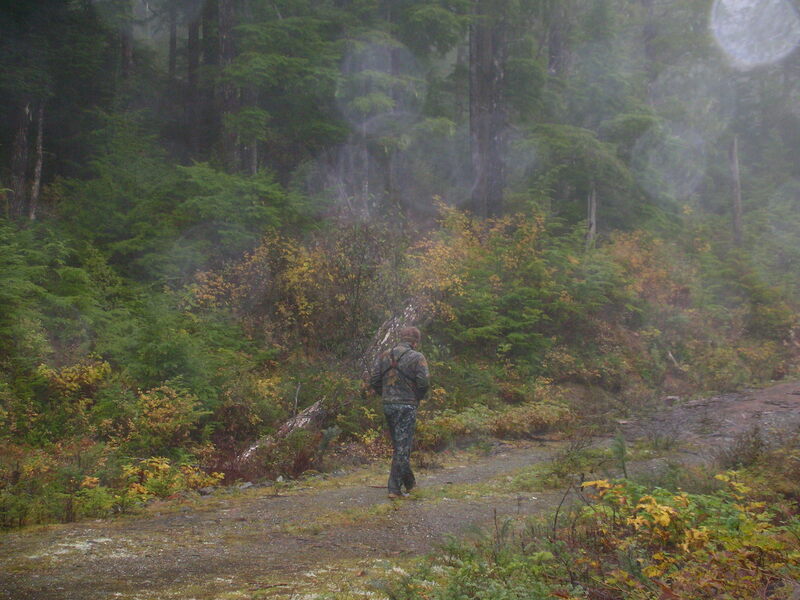 He went back down to Kake, AK with high hopes for round #2 of the moose hunt, but still no moose could be found. We found sign that they really do exist in Kake, Lee called and called and called but unfortunately no moose this year. In the closing moments of daylight on the last day, I saw a black bear on the side of the road. Lee all but fell out of the truck door rifle in hand and made a very impressive shot that pretty much dropped the bear in his tracks. So, he did not come home empty-handed and with a 2013 hunting record much improved. The weather was quite a challenge for me … solid rain for 1 of 2 days of the hunt. I may or may not have been in sheer misery for most of that first day. The second day the sky cleared and the sun even came out … Kake is a beautiful area and I truly was able to enjoy the trip and be thankful that I had this opportunity to explore a new part of this great state and have some quality time with Lee. Shawn (Lee’s brother) and his daughter Carly came along too. 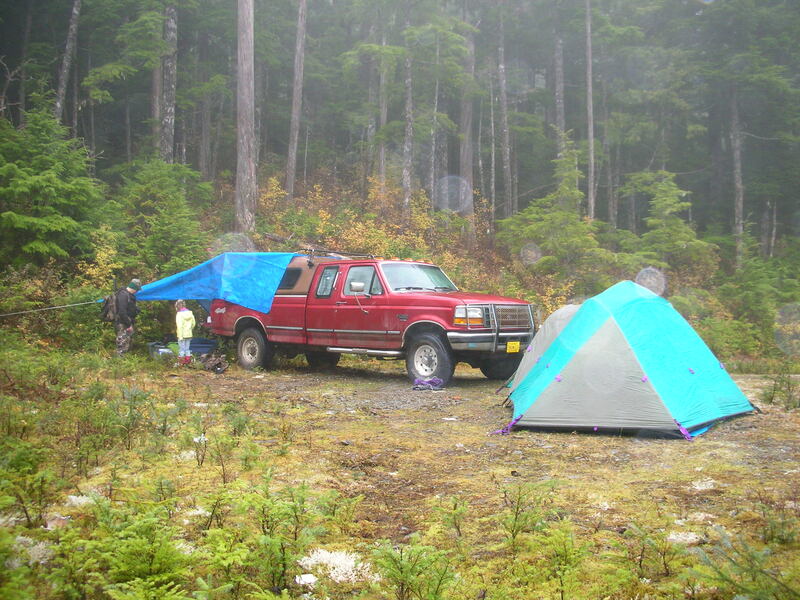 They slept in the tent while Lee and I laid our bedrolls in the covered bed of the truck. We did all the cooking on the tailgate under the tarp to get out of the rain and mist. Lee and Shawn are two salty guys … they toughed out most of 10 days hunting in the rain earlier in October! Carly shot a grouse, her first hunted beast. We ate it sauted in Lipton Southwestern Rice. Yum! I tried to get my hair to look like my mountain man’s hair … he said I did not have enough grease. The sun came out! We found this beautiful area of woods off of an old logging road that we spent some hours calling and hunting in. We left Kake early in the morning on Wednesday, check out the beautiful sunrise over the new snow on mountain tops! Lee always looks forward to a hearty ferry breakfast! Well-rounded eggs, hashbrowns, toast and sausage with a healthy side of bacon! This entry was posted in Hunting & Fishing, Uncategorized. Bookmark the permalink. Thanks for including so many GREAT pictures! 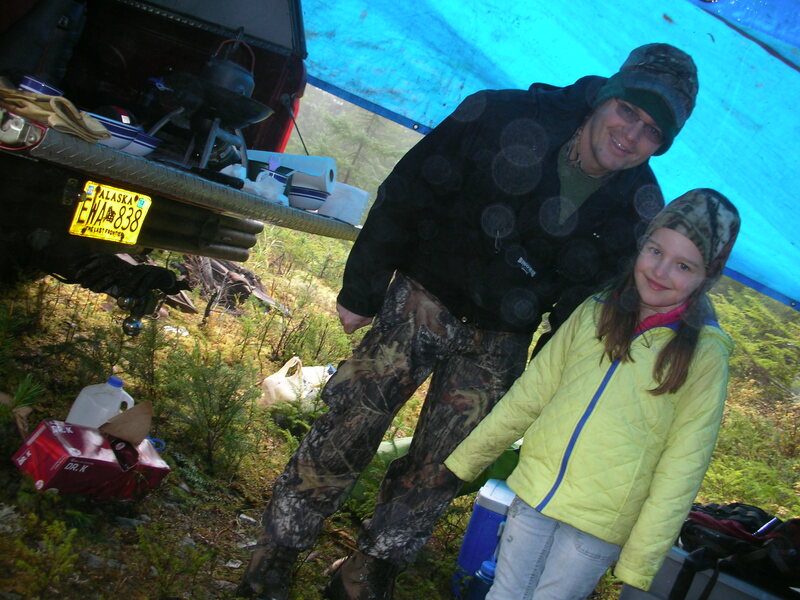 I’m so excited for Carly – wow, a true Alaskan girl with her first successful hunting trip. Even though it was wet, and there weren’t any moose around, it looks like you had a great time!